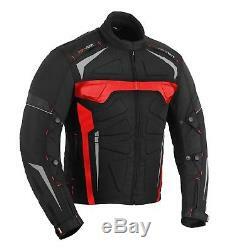 Motorbike Waterproof Armored Jacket Red. Removable and Washable Quilted lining. 5 Pockets - 2 x front - 3 x inside. 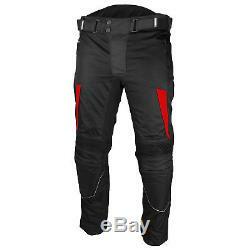 Motorbike Mens Armored Trouser Red. Anti slip material at middle. 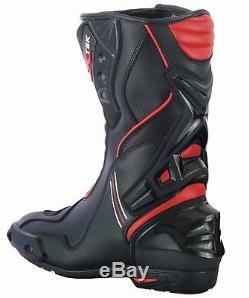 Motorbike Mens Armored High Ankle Boot Red. Side Zip Opening with Velcro Strap. For more information please see product description tab. XS, M, L, XL, 2XL, 3XL, 4XL, 5XL, 6XL, 7XL. UK 6, UK 7, UK 10, UK 11, UK 12 UK 13. Size chart is located at the end of this page. 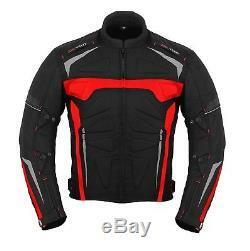 Mens Waterproof Motorbike Jacket in 600d Cordura Fabric. Bartack sewed at almost all joints to prevent snapping. Zip corners are also Barteck sewed to provide long lasting performance. Dobby Mat Fabric at shoulder. 6 Air Vent Zips: 2x front Shoulder, 2x Back Shoulder, 2x at Back. 12x Reflective Panels: 4x Front, 4x Back, 4x Sleeves. 5 Pockets: 2x at front, 2x in Lining, 1x Fasion zipped pocket inside for documents etc. Adjustable Arms - 80/50 Original Brass buttons for Arm adjustments. Velcro strap belt for waist adjustment. Neoprene Fabric at Collar edges. Soft Microfabric material used in Collar. All weather Jacket (This jacket can be used in summer and winter both as the warm quilted lining inside is removabale). Mobile & wallet Pocket inside. 100% Waterproof: Special material inside to make jacket fully waterproof. CE Approved Removable Shoulder and Elbow Armours. Thick foam padding Protection at back. Cuff and waist adjustments with Velcro strap. Extra Foam Padding at front and Back to provide maximum protection. Quality 100% waterproof Korean 600D Cordura construction. CE Approved Removable KNEE & HIP Armors. Anti-slip material at middle prevent to skid from motorbike seat. 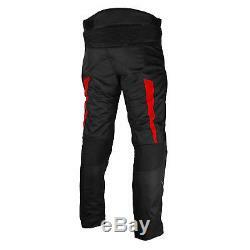 Quality waterproof ykk zips + 11 ankle zip for ease taking trousers off & putting them on Velcro strap over ankle to tighten the gap and reduce draft and up spray. 3M Reflective material to increase visibility. 8 connection zip to zip into our matching jackets. 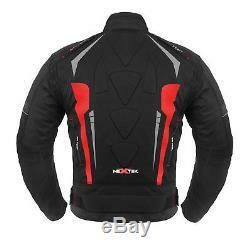 Great for winter and summer as has removable thermal lining. Elasticated panel at knee area & adjustable waist belt. Double layered bottom & knee sections. 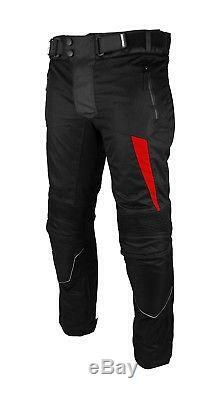 Stylish Zip Pockets on both Legs. 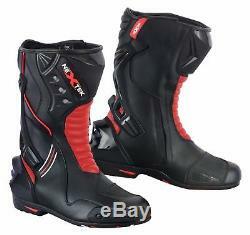 Premium Quality - 100% Real Leather & Waterproof Motorbike Boots. Lined with Soft Polyester inside (Extra Comfort Guarantee). Accordion At Front & Back for Easy Movement. TPO Hard Protection at Back Heel & Ankle. Easy To Wear and Use. Side Zip opening with Velcro Strap Fitting Adjustment. Perfect Gear Panel and Tread Design. 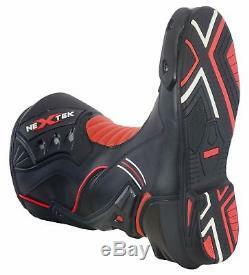 Non-slip, oil and petrol resistant sole. New Design Ladies Motorbike Jacket available in all s. Please check the product thoroughly before start using it. We only dispatch replacement once we receive original item back. 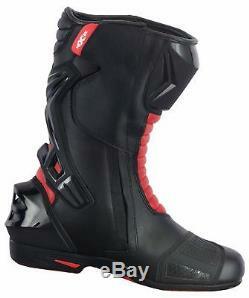 The item "Motorbike Suit Waterproof Motorcycle Jacket Trouser Armoured Biker Leather Boots" is in sale since Thursday, January 25, 2018. 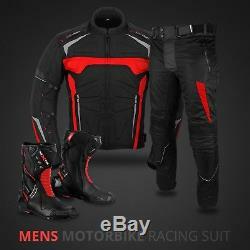 This item is in the category "Vehicle Parts & Accessories\Clothing, Helmets & Protection\Motorcycle Clothing\Riding Suits". 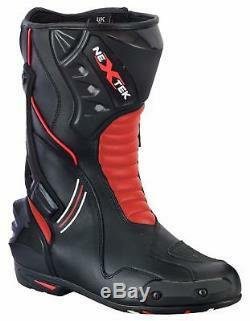 The seller is "rextek-bikers" and is located in Southall, Middlesex. This item can be shipped to United Kingdom, Austria, Belgium, Bulgaria, Croatia, Cyprus, Czech republic, Denmark, Estonia, Finland, France, Germany, Greece, Hungary, Ireland, Italy, Latvia, Lithuania, Luxembourg, Malta, Netherlands, Poland, Portugal, Romania, Slovakia, Slovenia, Spain, Sweden, Australia, United States, Canada, Brazil, Japan, New Zealand, China, Israel, Hong Kong, Norway, Indonesia, Mexico, Singapore, South Korea, Switzerland, Taiwan, Thailand, Saudi arabia, South africa, United arab emirates, Ukraine, Chile.